Will Dobbs' huge, comeback performance once again propel Tennessee down the stretch. With Tennessee’s season on the line, Joshua Dobbs willed his team to victory with a performance unmatched by any in his college career. In fact, only two players in the last 20 years of SEC play can claim to have had as much production as Dobbs had against Georgia. Considering the historical numbers and the magnitude of the game, the choice to name Dobbs SEC Offensive Player of the Week must have been easy for the league office. 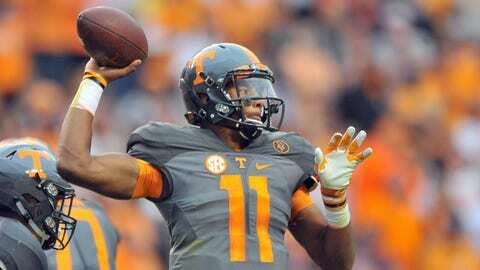 •	Dobbs is 3rd player in SEC over last 20 years with 300 passing yards and 100 rushing yards in a game. Others are Johnny Manziel and Tim Tebow. •	Dobbs is only player in Tennessee history with a 300-yard passing game and 100-yard rushing game (done it twice, also at South Carolina last year). •	Career-high 312 passing yards for Dobbs. •	430 total yards (312 passing, 118 rushing) with 5 touchdowns total (3 passing, 2 rushing). •	Dobbs 3rd career 100-yard rushing game. •	Dobbs 2nd career 300-yard passing game.